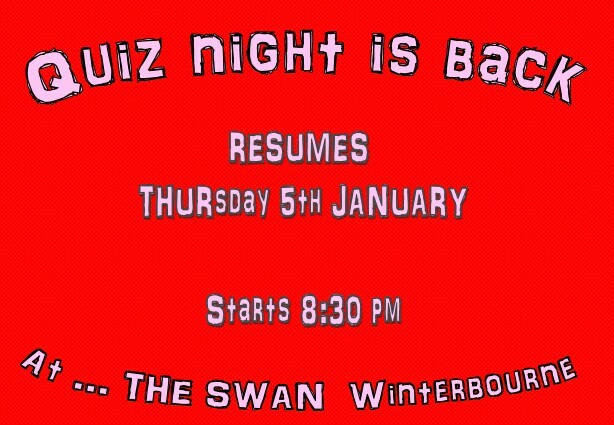 January 5, 2017 2:56 pm Published by Sandra Dolan Great fun at our Quiz Night each THUR at Smokehousesaloon Located in our Smokehousesaloon Restaurant at The Swan, Winterbourne, our quiz kicks off each Thursday at 8:30pm and goes on to approx. 10:30pm. There is a maximum of 6 to a table and entry fee is £2 per person with all proceeds shared amongst the top two winning tables. The quiz questions which are set by our amazing quiz masters Gary and Sally Dunne are both fun and a little challenging. Crossing a wide range of topics each week, you just never know who's going to bask in quiz glory.... an "no", Gary is not allowed a sports round although he'll always sneak one or two footie questions in!!! We also have a post box draw that costs an optional £2 per team. Starting with 10 keys (one of which opens the box), one team is drawn out of the hat weekly and a member of that team will pick a key. If the key fails to open the box, it is set aside. This continues each week until the winning team opens the box.